Project Gettysburg-León Celebrates Nicaraguan Culture at Waldo’s | The Gettysburgian. Students and the community alike came out to Waldo’s last Friday night to experience Nicaraguan food and art. The event was put on by Project Gettysburg-León (PGL) to help raise money for their Children’s Education Project in Nicaragua. The main dish was a tortilla on which you could add a variety of fillings, and the desserts included doughnuts and a savory candy called Pulparindo. Two special drinks were added to the menu in honor of the event: a hibiscus soda and an arroz con piña, a pineapple-inspired drink. Although the food was delicious, the main part of the evening revolved around the art. The walls of Waldo’s were covered in bright photographs depicting typical Nicaraguan culture as well as colorful paintings done by both Nicaraguan and local artists. One of the artists from Nicaragua was Marlon Moreno who came to the United States through a grant and is studying at the Maryland Institute College of Art. Moreno is one of the lucky ones as many of his fellow Nicaraguan artists were prevented from coming to the United States because of the civil unrest plaguing his country. “This is getting big,” Moreno stated, explaining that the United Nations just held a meeting to discuss the problems in Nicaragua. The leading organizer of the event, Littlestown School Area English teacher Jessica Woodard, has been to Nicaragua twice. She stated that the problems in Nicaragua stem from President Daniel Ortega, who has been making radical economic changes leading to peaceful protests. Since the protests started this past spring, Ortega has responded aggressively, taking over three hundred innocent lives. Because of this, schools have been closed since April and children have no place to learn. Jill Rakowicz, a local art teacher who went to Nicaragua in 2015, helped teach Nicaraguan children art at their non-profit school, Xuchialt. She stressed how their crisis is “damaging to the economy as tourism is a main source of income.” With the streets not safe enough for children, many tourists will decide they no longer want to come. In an effort to help, PGL organized this event to raise money to provide a safe place for Nicaraguan children to go and learn. All of the art is being sold at Waldo’s until October 1 as well as at Salsa on the Square on September 28. “I love the people of Nicaragua, the country, and friends I’ve made there with other artists,” Woodard said when describing what motivated her to plan this event. Through her actions, she was able to spread word to the town and students on campus. This event demonstrates how people hear about events in town through posters and word-of-mouth, helping to spread awareness about important issues. Student desire to get involved and be a part of something is a defining characteristic of the Gettysburg College community. 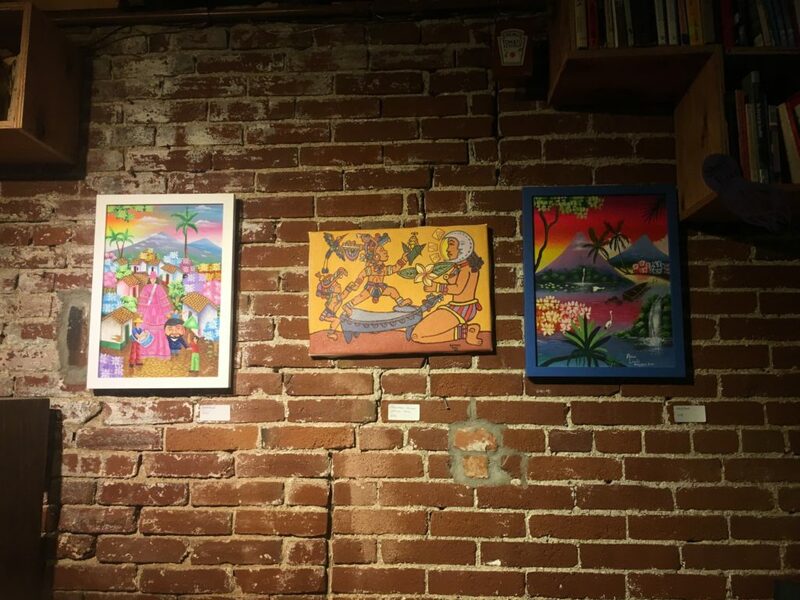 The Waldo’s fundraiser for Nicaragua was about more than eating great food and admiring beautiful art; it was about how a culture and a community have come together to support an important cause.